CHICAGO — The man who ransacked a Gold Coast 7-Eleven on New Year's Day — and filmed himself doing it — is an Internet prankster and part of an up-and-coming local rap crew who has documented his hijinks in dozens of videos on YouTube, Vine and Facebook, where footage of his latest antics has racked up more than 2.2 million views. He goes by the name VonMar, and on his Facebook page, where he posts clips of his rapping and pranks, he said he aspires to be like the stars of "Jackass," who made careers out of antics ranging from the hilarious to the cringe-worthy. They, too, made a habit out of causing destruction, including brawling in a department store. "They were doin the Same EXACT THINGS im doin UNTIL THEY GOT FOUND n Started GETTIN $$$$," he wrote on Facebook. "Guess WHAT?? im on my WAY." 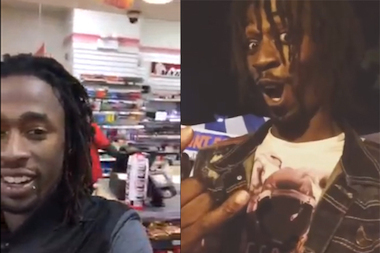 Internet prankster and local rapper VonMar filmed himself and friends ransacking a Gold Coast 7-Eleven on New Year's Day. The New Year's Day video was posted Jan. 2 on the rapper's page, which is associated with a man named Lamar Irving. Irving professes to be a model, a student at Columbia College and an alumnus of Kenwood Academy. The video shows a group of at least two men entering the 7-Eleven at 45 E. Chicago Ave. and one of the them leaping backwards onto a rack of merchandise. 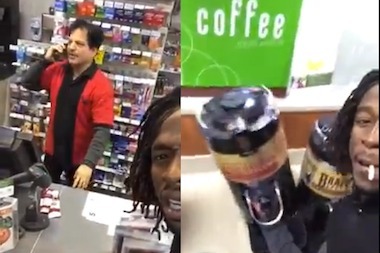 "He fell, bro," VonMar, who is filming, tells the store clerk. Later, he does the same thing, then climbs on top of the rack, kicking bags of snacks on the floor. Smoking a cigarette, he goes behind the counter and tries to use the cash register. Later, he taunts an employee attempting to call police. "I'm world famous. I'm on Worldstar," he said, referring to the popular website known for hosting videos of fights and other mayhem. "Oh, you scared. Call them." Throughout the video, he hollers the catchphrase that has helped make him famous online, "Put them in a coffin!" The two men leave, taking a large coffee urn with them, before ditching it and hiding in a nearby building. Police confirmed officers responded to a call of destruction of property between 6 and 7 a.m. Thursday, but had no more information. Several calls to the 7-Eleven went unanswered. VonMar claims to be part of the ThotBoyz rap collective, and has filmed dozens of capers and posted them online, racking up millions of views. In addition to filming similar clips of him jumping on merchandise, he has filmed himself leaping upon unsuspecting beachgoers napping, taking his pants off in a store, smoking a joint in a Subway, slapping the buttocks of an elderly man walking, bailing on a cab fare and engaging in other pranks and antics. In a 6-second Vine video he posted about the 7-Eleven incident, he wrote, "WRECKIN 711 LMFAO," followed by a string of emojis. In addition to the 2.2 million Facebook views, the video has more than 875,000 views on Vine and more than 600,000 on WorldStar Hip Hop's page. He did not respond to repeated requests for comment. Police said he could face charges if he is arrested.